The ultrasonic sensors are used to detect the object, to measure the distance of the object and has many applications. 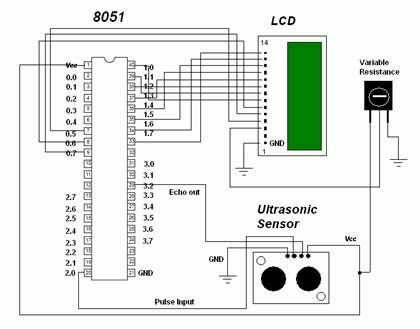 This article discusses the circuit of the Ultrasonic Object Detection sensor using 8051 microcontroller. The Ultrasonic sensor provides the easiest method of object detection and gives the perfect measurement between stationary or moving objects. The sensor measures the time required for the sound echo to return and send the same to the microcontroller as variable width pulse. 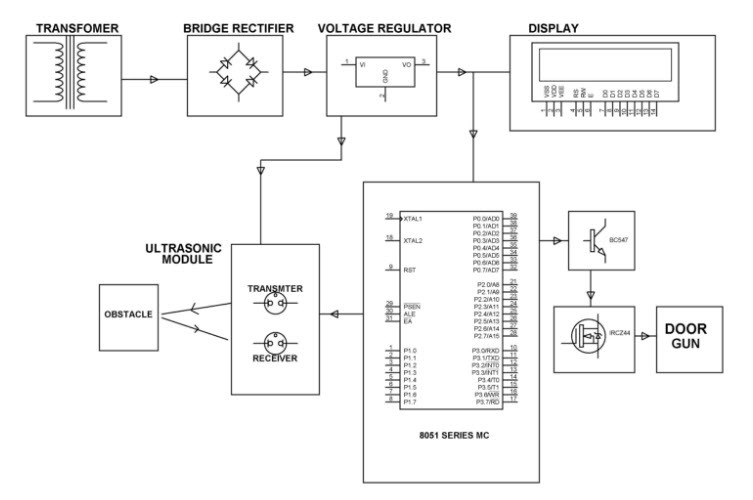 This circuit is designed to demonstrate the detection of an object ahead of the ultrasonic transducer. An ultrasonic transducer consists of a transmitter and a receiver. The transmitter produces 40KHz sound wave while the receiver detects the 40KHz sound wave and converts it to electrical signals which are fed to microcontroller. This circuit is designed with an 8051 micro-controller and an ultrasonic sensor. The sensor transmits the ultrasonic sound waves of kHz. When an object or obstacle comes ahead of the sensor, the sound waves are reflected. Then the receiver detects the kHz sound wave. The ultrasonic sensor sends a high-frequency sound pulse and calculates how long it takes for the echo of sound to revert back. The speed of sound is approximately 341 meters per second in air. The sensor uses the speed of sound in air and time taken by the sensor to transmit and receive the sound to calculate the distance. Thus detects the object and finds the location of the object. The sound has to travel from the sensor to object and revert it back so, divide the speed by 2. The Trig pin is used to send the signals and the Echo pin is used to listen to the returning signals. Note: when installing, connect the GND terminal first, otherwise, the module may get damaged. Provides precise and noncontact distance measurement within 2cm to 3m range. Ultrasonic measurement works in any lighting condition, hence a supplement for infrared object detector. Burst indicator LED shows measurements in progress. 3 pin header makes it easy to connect to development board directly or with an extension cable without any soldering. Used to develop security systems, interactive animated exhibits, parking assistance systems and robotic navigation. A microcontroller is a highly integrated chip or a microprocessor with all peripherals like RAM, ROM, I/O ports, Timers ADC etc. on a single chip. It is a dedicated chip called as single chip computer. The 8051 microcontroller is a popular 8-bit microcontroller. It is based on 8 bit CISC core of Harvard architecture. It is available as a 40 pin DIP pin chip and works with 5volts DC input. 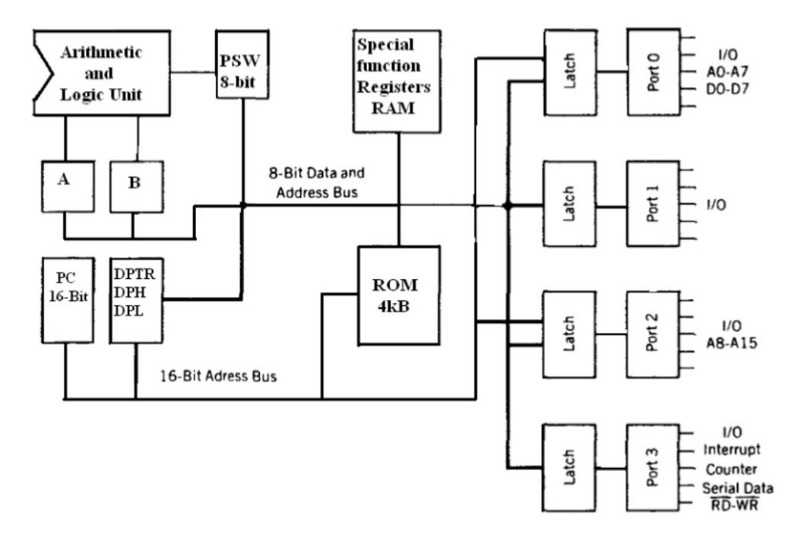 4KB on-chip program memory (ROM and EPROM). 128 bytes on-chip data memory (RAM). 32 general purpose registers each of 8 bits and five interrupts. Four parallel ports each of 8 bits with a total 32 I/O lines. One 16 bit program counter, one stack pointer and one 16 bit data pointer. One microsecond instruction cycle with 12 MHz crystal. One dull duplex serial communication port. The 8051 microcontroller is available in 40 pin DIP configuration. Among 40 pins, 32 pins are allotted for four parallel ports P0, P1, P2 and P3, each port occupying 8 pins. The remaining pins are VCC, GND, XTAL1, XTAL2, RST, EA and PSEN. A quartz crystal oscillator is connected across the pins XTAL1 and XTAL2 with a capacitor value 30pF. If a source other than crystal oscillator is used then the pins XTAL1 and XTAL2 are left open. The 8051 microcontroller has two pins for transferring and receiving the data through serial communication. These two pins are part of a port P3 (P3.0 and P3.1). These pins are TTL compatible and hence they require a line driver to make them RS232 compatible. MAX232 is used as a line driver. Serial communication is controlled by an 8-bit register called SCON register. This project can be used for applications like wildlife photography (Motion Sensing Camera Trigger), security area monitoring etc. We can precisely measure distances with Ultrasonic Object Detection Circuit. This circuit can be used as a burglar alarm. Thus, this is all about making of Ultrasonic Object Detection Circuit Using 8051 Microcontroller. We hope that you have got a better understanding of this concept. Furthermore, any queries regarding this topic or wireless technology based projects, please give your valuable suggestions by commenting on the comment section below.